As you all know, we have decided to swap from the old Neblio blockchain (as an NTP-1 token) to our own native blockchain, using the Ark code base. As planned, the development and integration has been made easier for us and for future merchant integrations, exchanges and even for consumers who no longer have to pay any fee for any other type of cryptocurrency. The mainnet has been launched on the 17th of August 2018. Since the launch, the community has been growing and a few members have become delegates on the Qredit blockchain. On the 27th of September, we ran a full stress test on the blockchain with incredible results. We would like to thank the community for participating in the development of Qredit! During the swap, the early investors have been able to apply for a refund at ICO price or a swap at a 1:100 ratio. Unfortunately, around 65% decided to go for a refund. We aim to finalize all swaps including the funds on TradeSatoshi on the 30th of October 2018. It was great to see that earlier this week, some members who have applied for the refund in August, decided to go for a swap instead. Windows, MacOS, Linux, Android and Web wallets. Our goal is to get our app listed on the Apple Store as well. More details will follow soon. On the 15th of September we have created an airdrop program. Thanks to the airdrop program, we currently have more than 3000 members in our Telegram channel. The pay-outs of the airdrop program will occur on the 30th of October 2018. This is for anyone who has participated in the Bug filtering Airdrop Program. 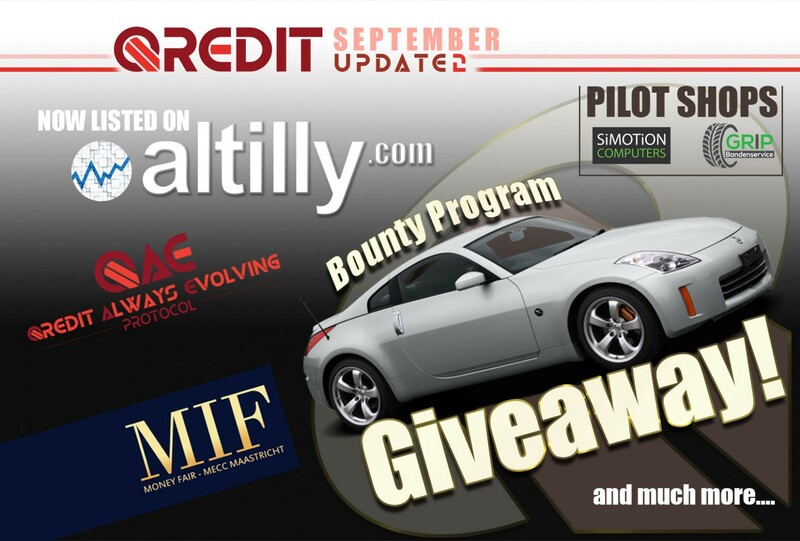 Only recently, on the 27th of September 2018, Qredit has been listed on a small, but very transparent exchange called: “Altilly”. Altilly is a trading exchange that aims to stay transparent with maximum security and low trading fees. Having Qredit listed on Altilly, gives us the advantage of using the API’s and other services from third-parties like Coingecko, Blockfolio, Coincodex and GetDelta. The API’s, for example, will be used for Qredit Motion (Crypto-to-Fiat-Conversion) and for showing the correct price on the mobile apps. Since a lot of people have joined our Telegram channel, some users prefer to use Slack, while others prefer to use Discord or Telegram. We have created a Reddit page and a Discord channel. However, some messages posted on the Discord channel can be missed by users in the Telegram channel. For example: delegates or pools that are looking for votes from other members. We have listened to your request and created a central forum for all members. Vote requests and other suggestions can be made here. Not only news, but also guides, tutorials and much more can and will be published on the forum. You can visit the forum by clicking here or by clicking on forum in the top menu. Let’s continue with the most exciting part of Qredit so far! Earlier this month, we have released a few hints about QAE. QAE stands for Qredit Always Evolving Protocol. Obviously, with the most cryptocurrencies, you can trade, send or receive coins and tokens. QAE will be the dashboard for anyone who would like to go a bit further with Qredit and the Qredit Blockchain. The basic functionalities of QAE Dashboard. The homepage will show the latest news about Qredit and the merchants who are using Qredit. On the homepage you will also find the bugreport form and the network status of Qredit services (the blockchain, website, wallets etc). The QAE wallet will replace the traditional Qredit web wallet. You will now be able to set a name for your wallet and upload multiple wallets. In the future, you will also be able to directly connect your Ledger to the web wallet. For now, the Block Explorer is pretty much basic. In the future, you will be able to manage your funds to reward voters that have voted on your delegate. You can also view vote reports directly on this page or check manuals on how to become a forging delegate. With Qredit Motion you will be able to convert your coins to fiat currency or buy Qredit coins with fiat currency. More information about this will be announced later this year. Since the swap to our new blockchain, the goals for enabling and using NFC cards, tags and devices for sending and receiving Qredit, have not been changed. Qredit Wave is the new name for wireless services on Qredit. On QAE you will be able to program your own wallet address or pin code into your NFC tag. With Qredit Wave you can also easily check your balance, transfer and receive funds to or from other companies and individuals. Qredit Wave will be available on desktops and mobile devices. QAE Smart Contracts will allow users (especially merchants) to create their own token on the Qredit Platform. These tokens can be used to replace the current rewards system. Instead of using traditional stamps or points for consumers, merchants will be able to reward their customers with their own token, showing their own logo and metadata (for example website and contact information). The tokens can also be used between merchants and their suppliers. The Altilly Marketplace offers API’s to connect directly to your marketplace wallet. Instead of logging in to the marketplace, you can easily trade with Qredit within the QAE dashboard. ACES (Ark Contract Execution Services) is a great feature created by the Ark developers. The Marketplace console is a consumer dashboard which allows searching and executing service contracts listed on the Marketplace. ACES providers can list their services nodes using the Marketplace API. The KYC tab in the QAE dashboard is a new and unique functionality of Qredit. As most of you people know, it can be a hassle to join ICO’s by uploading your official documents repeatedly, not knowing if the 3rd party is being safe with your documents. Starting OTC trades without a middleman can be very risky as you don’t know if you can trust the other party. Exchanging your crypto to fiat or vice versa is not widely accepted for altcoins, because it’s not always that easy to trace where the funds came from or who owns them. Sometimes you receive a promotional offer from someone who claims to be a worker from a company, but most of the time these people are not who they claim to be. The KYC function in QAE is here to avoid all these problems. The KYC function allows you to connect your wallet address to your personal ID or social media account without storing the data on the blockchain and it works like Paypal, by simply sending small amounts of funds to a specific wallet address. You can share your information with a trusted American company that handles your information following the highest privacy protocols. The end user (ICO holders, banks, or individuals) can only see whether you are connected to this third party or not. More information about this functionality and the agreement with the third party will be announced in October. The QAE dashboard is a product in development. Some of the functions have been disabled for now. In the next month, most of the functionalities will be enabled one by one. Updates will be announced on Telegram, Twitter and on our website in the blog section. Want to see a preview of QAE? Click here! So, what is planned for next month? A lot of exciting updates will be announced next month. Two shops have agreed to integrate Qredit in their store for us as a pilot. “Grip Bandenservice” (a tyre and wheels shop) and “Simotion PC Solutions” (a computer hardware, software and repair shop). These two shops will be using Qredit as a payment gateway, starting this Monday. The functionalities of QAE, Qredit Wave and Qredit Motion will be tested by these 2 companies. Maastricht International Fair 2018, with a floor area of more than 5000 m2, has one of the largest collectors, investors and traders in the field of coins, precious metals and banknotes (paper money). During this fair, many merchants from all corners around the world will be present. MIF also recently announced to allow crypto currency traders and blockchain companies to join their event. We will be actively introducing Qredit at MIF, by allowing visitors to purchase drinks and food with Qredit. Merchants in the food corner will be using Qredit Motion to swap their Qredit coins to fiat currency. We have also invited several municipalities from the southern region of the Netherlands, to join us at the MIF event and see Qredit in action. Our goal is to collaborate with the municipalities for future integrations. Click here for more information about the MIF event. In October we will update the mobile wallets to view the latest price conversion of Qredit to fiat currency. These updates are done automatically from the Google Play Store. The partnership for the KYC functionalities will be announced in October. More functionalities of QAE will be developed and released this month. We are going to setup the manual for the old Qredit Cards and re-introduce the new Qredit Cards. We are also working on webshop integrations for Qredit. This will allow consumers to pay for certain products online, using Qredit or other cryptocurrencies. With the possibility for the merchants to convert their Qredit directly to fiat currency. The webshop plugin will first be introduced on our own multivendor marketplace, called: HODLbazaar. HODLbazaar allows consumers to sell their own items on this marketplace with escrow and crypto-to-fiat conversions. In October we are going to announce another partnership with a country on the African continent. Unfortunately, you may understand that we are not going to publish any names right now and we are also not going to hint or answer any questions regarding the partnerships. Our goal is to increase traffic on the Altilly exchange, join CoinMarketCap and create more awareness for Qredit. To accomplish this, we have decided to create a bounty program for traders with the highest volume on the Altilly Marketplace. A total of 1000 traders will be rewarded for trading Qredit on the Altilly Exchange. The rewards are Qredit merchandise, a total of 10 million Qredit coins and the first price: a Nissan 350Z, tuned by Hodler Racing. Another bounty program for delegates is also planned for October. We have 2 more exchange listings planned for October. Follow us on our social media channels to be the first to receive the early announcements! No! As always, we announce surprise updates between the regular updates. Thank you for reading this post and we hope you enjoy the ride.